This apartment is located on the top floor of a beautiful late 19th century Haussman-style building, with a beautiful view over the rooftops of Paris, the top of the Eiffel Tower and even a glimpse of the towers of Notre Dame cathedral and the Sacre Coeur. It is located in the heart of the 1st arrondissement, on a street perpendicular to the rue de Rivoli, with its many high street fashion boutiques, La Samaritaine; one of the oldest department stores in Paris in the process of being converted into a luxury hotel. The Seine and the famous Pont Neuf (the apartments street is actually named after this bridge) linking the right bank to the left bank via the beautiful Ile de la Cite is just a couple of blocks away to the left when you walk out the . If you turn right outside the front door you have the New gardens of Les Halles, which are in the process of being transformed at the moment and to the other side the stunning church : Eglise Saint EustacheThe Marais and its 17th and 18th century mansions, museums such as the Pompidou center, the Louvre and farther down, the Place de la Concorde are all within walking distance. The Pont Neuf literally means ‘New Bridge’, in reference to the famous bridge built in the late 16th century by Henry III and later inaugurated by Henry IV. The bridge was built in stone, which for the time was a novelty and therefore considered extremely modern. It was also the first bridge to be built without any houses on it; a novelty at the time! It’s restoration was completed in 2009 revealing it’s very beautiful Burgundy stone color. Unesco has classified it as a World Heritage Site. The apartment is located on the 7th floor of a fully secured building, that has a small, elegant marble lobby and an elevator. There is a code to the access the street door as well as an intercom and a magnetic key to open the second lobby door. This loft-style apartment is 100 sq. Meters, with its waxed concrete floors, high ceilings, large skylights and white painted wood beams. The apartment is bathed in light at any time of the day, with windows on every side and is decorated in a bohemian shabby-chic style with vintage furniture, plants and original artwork. You enter the apartment by a small entrance hallway with a personal home sauna to your left, that was recently installed by the owner and can easily accommodate 3 people. What can be more relaxing than spending a few moments in your own private sauna after a day of walking and shopping in Paris! Behind the sauna is a large dressing room with an ironing table and a (washer/dryer machine). On the right side of the entrance is the bathroom, with a bathtub and sink. The walls are mosaic tiles and have plenty of cabinets and a towel heating rack. The toilets are separate, right next to the bathroom and also have a small sink. The entrance hall opens out to a spacious living area to your left, the sleeping area to your right and a very large kitchen/dining area at the end on the right. 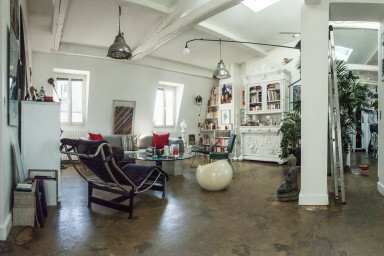 The living area has a very comfortable couch, several seats including a Bertoia Diamond chair and the famous LC4 by Le Corbusier, a large Henri III style dresser which the owner has given a quirky modern feel by painting it white and filled with books and art objects. The kitchen/dining area is separated from the living room by a block of lush vegetation; It comes with a beautiful Louis-Philippe style table that has been enlarged by a glass panel in the middle to seat 6 people. There is a large fridge and freezer, a 4 burner vitroceramic stove and oven, a dishwasher, many cupboards and of course a coffee maker, kettle and toaster. The bedroom area has a comfortable queen-size bed, a large flat screen TV on the wall and a corner office. This part of the apartment can be made ​​more intimate by closing a set of linen curtains. From the bedroom area a staircase leads to a comfortable mezzanine which, for the most part, has enough headroom to stand up straight. It is actually above the entrance, and has another queen size bed and sink. There is also storage space and a small office area there. The apartment is, of course, equipped with many modern amenities: remote control skylights, TV with cable channels, wifi access throughout the entire apartment and a telephone with unlimited calls to landlines in most countries around the world. This apartment is very comfortable for 4 people, in a bohemian-chic loft spirit. Please note however that the room and the mezzanine are open spaces, to keep the spirit of the apartment, and the mezzanine is accessible by relatively steep stairs, so it might be inappropriate for young children or people with mobility problems.